VATICAN CITY (CNS) — Unable to resist telling the world about a personal event that is dear to his heart, Pope Francis said that 70 years ago to the day, he celebrated his first Communion. “They say that you shouldn’t talk about personal things, but I can’t resist the temptation,” he said at his weekly general audience in St. Peter’s Square Oct. 8. “Today I am so thankful to the Lord because 70 years ago I made my first Communion,” he said with a broad smile. “Let us all thank the Lord for our baptism, all of us thank him for our first Communion,” he said. The 77-year-old pope revealed the personal tidbit to underline what it means to enter into communion with the Catholic Church and to seek communion with Christians who belong to other confessions or traditions. This theme of Christian unity was part of the series of audience talks the pope has been giving on the nature of the church. Leading the general audience meant Pope Francis skipped the morning session of the extraordinary Synod of Bishops, which was meeting Oct. 5-19 to discuss the pastoral care of families. 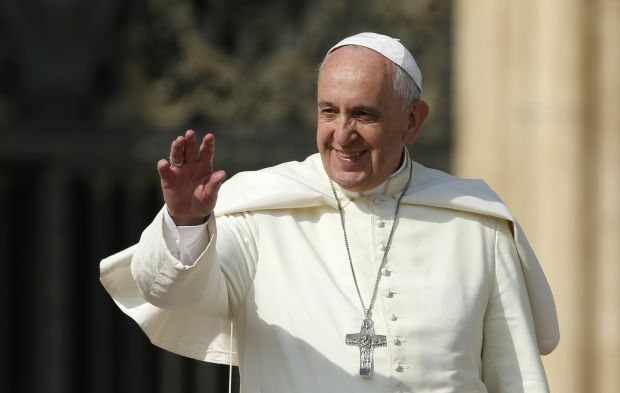 People’s efforts to share the Gospel message will be “much more credible” when all Christians show they are “able to live in communion and love each other,” the pope said. Unity was already under threat while Jesus was still with his disciples, who would argue “among themselves who was better, who was more important,” the pope said. In fact, history shows “the church is tempted by evil, which tries to divide her, and has been marked unfortunately by serious and painful divisions;” some breaks have lasted so long it’s hard to recall all the reasons for the separation to begin with and to find possible solutions, he said. The pope said, “It’s painful” to see so many divisions among Christians when they all believe in Jesus Christ as Lord, God the Father and the Holy Spirit. Focusing on what unites Christians and not what divides them involves “concretely adhering to the truth, together with the ability to forgive, feeling a part of the same Christian family” and working together in charity helping others, he said. Pointing to the Oct. 11 European day of awareness about organ donation, the pope emphasized the need to safeguard the rights of donors by ensuring “certainty of death,” given the existence of some questions about methods of ascertaining brain death in an individual. While riding in his popemobile to greet pilgrims at the beginning of audience, Pope Francis pointed to an exuberant young boy, who was cheering along with his classmates, all sporting orange baseball caps. The pope gestured as if to ask the boy if he wanted to go for a ride, and the boy enthusiastically agreed and tried to jump the high wooden barrier, succeeding only with the help of a Vatican guard. One of the boy’s classmates didn’t want to be left behind and the pope gestured for him to come along, too. The two boys, about 8 or 10 years old, sat down behind the pope in the popemobile, hugged each other and pumped their fists in the air with excitement. The pope let them ride several laps around the square, and when he brought them back to their group, a guard insisted the boys not get down without giving the pope a kiss on the cheek.